It is the beginning of the year, a time when many people make New Year’s resolutions that include losing weight, exercising more, eating better or some combination of the three. What if you could make one simple change that would help you lose weight and eat better? Go nuts. Particularly raw tree nuts, such as almonds, cashews, walnuts and pecans which have been shown to help with cholesterol, heart health, weight control and some cancers. Nuts are underutilized as a nutritious snack. A small handful of nuts contain protein, fiber, unsaturated fats and important vitamins and minerals. Almonds are good for your digestive system by providing a healthy dose of fiber and balancing blood sugar. They are also rich in vitamin E and can help with weight loss. 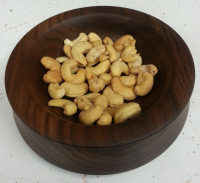 Cashews are rich in zinc, a boost for your immune system. The magnesium found in cashews can boost memory and they taste good! Walnuts are rich in omega-3 fatty acids which can reduce inflammation. Steer clear of nuts that have been flavored, roasted in oil, honey-roasted or heavily salted. These processes add unhealthy fats and unnecessary sodium. If you are concerned about your salt intake but really like the taste of salty nuts, mix both salted and unsalted nuts together and shake to distribute the salt evenly. If you want salty buy nuts that use sea salt. If you want to add a little spice to your nuts try this sugar-free Sweetish Nuts recipe…. Preheat the oven to 325 degrees. Mix 1 ½ teaspoons ground cinnamon, 1 teaspoon ground ginger, 1 ½ teaspoons vanilla extract and 1 ½ teaspoons extra-virgin olive oil in a large bowl. Add 4 ounces each of raw walnuts, raw pecans and raw cashews. Massage spices into nuts, then place on baking sheet and bake for 10-12 minutes. Cool and store in airtight container.